J’adore… Harry Potter Typography; It’s magical! I’m not ashamed to admit that I am a really big fan of Harry Potter; firstly the books because the films are amazing, but never able to compare to the amount of detail in the books, BUT there has been some really nice typography in the films. 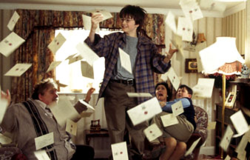 In the 2nd film, Harry Potter and the Chamber of Secrets, when Snape is telling Harry and Ron off about driving the magical car to Hogwarts after missing the train he is waving an issue of The Evening Prophet about infront of them. On the main, the Evening Prophet front page is quite boring (apart from the fact that the picture is obviously moving) but I like the bottom half which is mostly out of the shot because you can start to see shape going into the layout of the text! The 3rd film, Harry Potter and the Prisoner of Azkaban is when Harry is given the Marauder’s map by twins Fred and George Weasley. 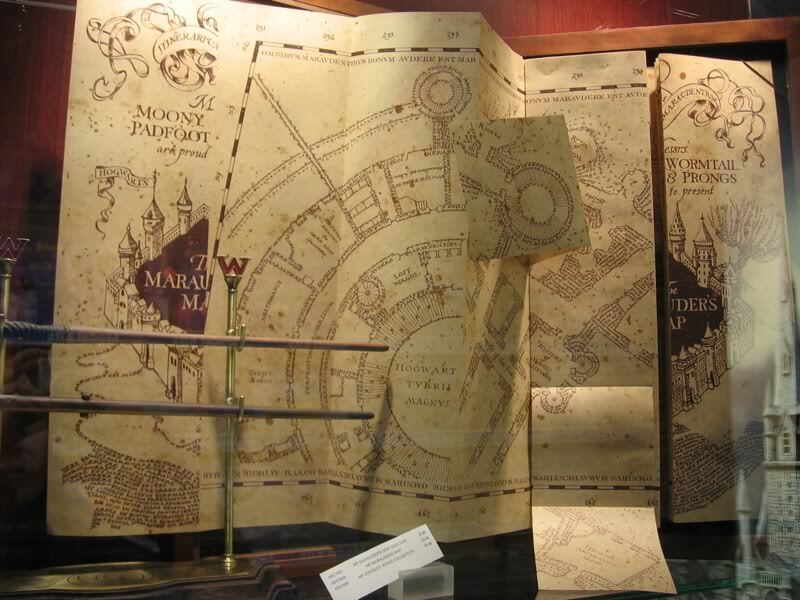 The Marauder’s map is a blank piece of old parchment, until it is tapped with a wand and ‘I solemnly swear I am upto no good’ is said. It is then that the ink reveals itself and the beauty of the map which is basically all typographical. The ink, and therefore map, disappears when it is tapped with a wand and ‘Mischief managed’ is said and it goes back to being just a blank piece of old parchment. I love the layout of the paper, where the text is of secondary importance to the shape and especially the heart shaped picture of Harry and Hermione with the heading shaped around it. I love how the Daily Prophet uses lots of bold, drop capitals in different fonts for a bit of variety and it isn’t too much either. They all tie in with the Harry Potter, medieval theme somehow! I also like how the page is JAM PACKED with stories, vertically and horizontally. I think this makes it really interesting to look at, but probably quite annoying to read as a newspaper! I think that every flash of the Daily Prophet in this film was so great; eye-catching and exciting even though you couldn’t properly read the whole story – you didn’t need to. Love it 🙂 I also managed to notice a few quite comical headlines in the flashes on the screen… the most memorable being ‘Vampire admitted to casualty after garlic bread overdose’ – SO much thought has gone into the newspaper which aren’t even important, it’s a nice touch and makes me smile 🙂 You can just about see the vampire overdose story in the top of picture above btw. The Order of the Phoenix sees them testing their latest product ‘Skiving Snackboxes’ out on younger students (and later teachers) and I love the handmade feel to the packaging for the snackboxes because really, they are homemade experiments by the twins. The packaging is cute; bright orange on the outside (something to do with their ginger hair maybe?) with little ribbon ties and pull out sections for the different types of sweets (puking pastilles, fainting fancies, nosebleed nougat and fever fudge). A lot of photos used in this post I found on flickr and belong to John Hicks, who is clearly appreciates the Harry Potter typography effort as much, if not more as I do. You can view all of his images here on his flickr account.